The Reverend Sun Myung Moon the "Spiritual" Commander In-Chief that ended communism. Moscow Dream: The power of prophetic dreams. 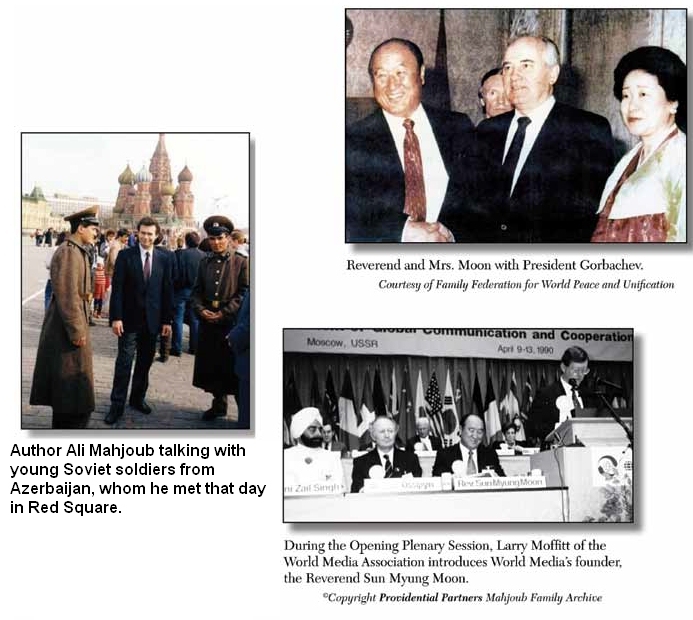 Moscow Dream is a very crystal clear prophetic dream that I had in early 1983, foretelling Reverend Sun Myung Moon's 11th World Media conference in Moscow, held April 9-13, 1990, approximately seven years after I had the dream. Moscow dream and other nine powerful clairvoyant dreams that came true are in my book, Honor Thy God. After my wife, Cynthia and I were selected from the UTS (Unification Theological Seminary) staff to go to Moscow to be part of the World Media staff. Suddenly, the dream that I had seven years prior began to play in my mind like a video tape. Scenes of Father Moon's Victory in the dream were so strong and real-like scenes compelled me to write a letter to President Kim to inform him of my dream. The following is my letter to the late, Dr. S.C. Kim, former President of the UTS. In the late 1983-early 1984, while I was a missionary, working with I.O.W.C. (International One World Crusade), the spiritual world was very active, and I received numerous deep, prophetic dreams. One of these dreams was about Father Moon's visiting Moscow. I wanted to share this dream with you because I believe it is revealing very important information about True Father's upcoming event in Moscow with the World Media Conference. Here is the dream. I dreamt I was standing while watching a rally held at Moscow airport. People were waiting at the airport arrival gate for the arrival of a very important figure who was to bring them freedom, prosperity, and peace. There were government agents in uniforms beating people over their heads and shoulders with big batons. The agents were trying to stop the rally and disperse the people from gathering to meet this important man. The people were strongly pushed forward to the arrival door. There were many television cameras paused at all angles. Newspaper journalists, photographers, and television reporters from all over the world gathered at the door with great anticipation. Suddenly, True Father Moon walked in through the door. He was their expected man! News reporters, photographers, and TV cameras rushed forward to Father. Television cameras zoomed in on him, and cameras flooded the place with flashlights. An American TV reporter was going wild in joyful disbelief. He was reporting the news, screaming loudly and saying, "My God he did it! My God he did it!" of Father's arrival in the Soviet Union. While this was going on, the people were still pressing forward to see Father. Government agents, in fear of being caught by TV cameras, stopped hitting people on their heads and shoulders while still trying to stop people from coming forward. The people were so compressed together there was no room for the agents to hit hard, so they finally gave up. Pictures were so real! Cameras recorded close pictures of Father Moon walking in fast with a huge crowd of press and dignitaries. Following the dramatic entrance, Father Moon and I were alone on the other side of the airport inside the Soviet Union. Suddenly, Father Moon became double! As he was walking in, he kept on switching on and off into a different person and then back into his real physical self again. This other person was shorter, smaller, different in looks, and had a shiny bold head...The end. President Kim, I had this dream about seven years ago, and for a while I shared this dream with our church brothers and sisters with whom I was working with at the time because I was fascinated with it. I wondered what it meant. Recently, when my wife and I were selected to go to Moscow to attend Father and be part of the World Media Conference staff. I began analyzing my dream, reflecting and wondering about who was that person into whom Father was transfigured? Suddenly, it dawned on me that the person was none other than Dr. Sang Han Lee, head of the V.O.C. teaching (Victory Over Communism)!! This person resembles Dr. Lee in every way, in looks, size, and in the baldness of his head. I had never met Dr. Lee before August last year when he came to the UTS and held a 21-day workshop on the Unification Thought. The dream was very revealing, not only because the man that Father kept on watching into was Dr. Sang Han Lee, but also and most importantly, what Dr. Lee symbolized. Dr. Lee symbolizes Father Moon's thought of the V.O.C... In other words, Father Moon walked into the Soviet Union "On the Wings of his Victory Over Communism!" I hope you enjoy this dream.